Yup, they still make the 450 Window Awnings! 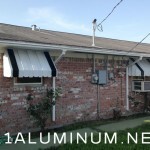 We installed 7 window awnings on this house. They still do the job, keeping out the heat, protecting the windows and window A/C units. They also add character to the house, don’t cha think? 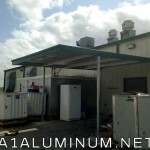 We installed this 12’6″ x 18′ Steel Cover at a restaurant in La Porte. The sheets are the PBR Galvalume Panels and the trim is Hunter Green to match the trim on the building. I’m sure this cover helps out tremendously when they are receiving deliveries. And yet another one for Baytown Scrap Metal. 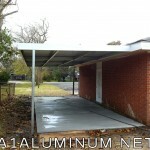 This is an 11’x13′ Steel awning between the carport we had already installed and the mobile home. We love our repeat customers! 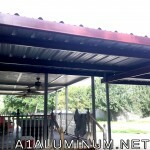 Here we have a galvanized steel patio cover. 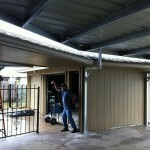 Custom fabricated steel with offset posts custom welded so the posts would hug the house. Also the awning counter-leavers over the roof line 18″ for extra height. Water runs into the house gutter. See our happy home owner?